Often ignored or duplicated, the simple meta description tag is actually vital for maintaining your site’s click through rate (CTR). In this post I’ll highlight the importance of the tag and explain how it works – and why it sometimes doesn’t! How is the HTML meta description tag used? Whenever you see a list of search results in Google, Bing or the other major search engines, you’ll notice a little snippet of information about each page below its link. If the page has an effective meta “description” in its HTML code, the description will often be displayed prominently in the snippet. Even better, if the site page meta description contains the search phrase or keywords that the user entered as a search term, those phrases and terms are likely to be shown as bold text in the Google snippet. Investing a little time and effort in creating a great meta description snippet will help your site to stand out in the search results pages (SERP). How does the meta description snippet boost CTR? It’s simple – a good meta description snippet is often your first direct communication with a potential site visitor. You need to tailor that little Google snippet to speak directly to your potential client, viewer or buyer. Don’t get the idea that your meta description tag has anything to do with keyword ranking SEO. This is a common misunderstanding. Google doesn’t rank your site based on keywords that it finds in the meta description! It simply marks any of the visitor’s search keywords found in the description snippet in bold text. Remember that this tag is about increasing your click through rate, not boosting your rankings with keyword SEO. This is easy! In most browsers just right-click in the page content and select “View page source” (“View source” in Internet Explorer) from the pop-up menu. This will show you the raw HTML code that builds the page. The quoted information after content=” is often displayed as the snippet below your site link. This can’t be guaranteed – the search terms entered, along with the quality of your snippet and site content are all part of the equation. Don’t worry too much if the meta description is blank on your pages – most search engines will extract relevant content from your page and build an informative snippet for you. Unfortunately, these machine-created snippets sometimes look a little garbled and confusing in the search results listing. By writing your own, tailor-made meta description you can attract more attention to your page link! 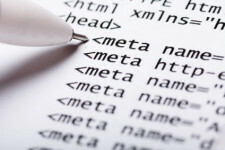 What are the rules for creating great meta descriptions? The first rule is to create meta page descriptions for all of your main pages. Good webmasters will have handled this already. Rule number two – don’t duplicate your meta descriptions. While small-scale duplication is likely to be ignored, large scale duplication may damage your search engine ranking. Don’t go crazy with the description. The recommended length is 156 characters, including spaces. Since Google changed their meta description display strategy in May 2018, we now believe that a CTA (call to action) is best placed at the start of your meta description. If your CTA doesn’t contain your focus keywords, these should appear in the body of your meta description. This isn’t for SEO – it’s just that they’ll show up in bold text if they match the phrases entered by the searcher. Bold keywords will have more impact if they appear close to the front of your meta description. A final recommendation … make the description ‘human’. It should appeal directly to a real person who is looking for your special page, product or service. If you have any kind of HTML editing experience it’s pretty easy to create or edit the tag with your usual plain text/HTML editor. WordPress users have the luxury of a superb Yoast SEO plugin that will guide you through the whole process. Oh … other SEO plugins perform equally well! Many other content management systems and online stores have their own facilities for editing meta tags. It’s often pretty simple and straightforward. If HTML edits seem a little too complicated you can speak to your site webmaster about updating the tags for you. It’s a quick, simple exercise that could help to increase the number of clicks on your site!